AUSTRALIA’S lowest paid workers will receive a 3.5 per cent pay increase. The 3.5 percent increase is well above the 1.9 percent rate of inflation, meaning a real rise in wages of 1.6 percent for Australia’s lowest paid workers. Minimum Wages in Australia averaged 615.17 AUD/week from 2007 until 2018, reaching an all time high of 719.20 AUD/week in 2018 and a record low of 522.12 AUD/week in 2007. Don’t get caught out on 1 July. Contact us to find out more and ensure you are paying your staff correctly. Winter school holidays are just around the corner, yikes!! Kuringai Wildflower Garden Junior Rangers programme. Library Activities – most libraries offer activities during the holidays. Lego workshops, Harry Potter magic lessons, cultural activities (aboriginal art), chess tournaments, movie nights, create your own movie in stop motion and more. The local library is a great place to check out. Central booking website: www.hippogo.com.au for multiple activities. So what is on the ATO’s list this year? Well, essentially, it’s looking at two main areas: work-related expenses and claims by investment property owners. – Deductions for home office use. – Union fees and subscriptions. – Mobile phone and internet costs. The ATO will also take a closer look at the booming market in investments in cryptocurrencies such as Bitcoin. Increasing numbers of taxpayers are jumping on the bandwagon and the ATO believes that some of them are failing to declare the profits (and in some cases the losses) they are making on their investments. Remember, investing in cryptocurrencies can give rise to capital gains tax on profits. – Ride-sourcing – transporting passengers for a fare (such as Uber drivers). – Renting out a room or house for accommodation. (Airbnb hosts are the obvious example.) The ATO is believed to be particularly concerned about taxpayers claiming the full CGT main residence exemption when part of their main residence has been rented out through Airbnb; the law prevents a full CGT exemption where part of a main residence has been used to earn income. – Renting out parking spaces. – Supplying equipment, tools, etc. – Completing odd jobs, errands, deliveries, etc. – Renting out equipment such as tools, musical instruments and sports equipment. The other main focus this year is on people who claim deductions in relation to investment properties and holiday homes. – The ATO has announced it will pay close attention to excessive interest expense claims, such as where property owners have tried to claim borrowing costs on the family home as well as their rental property. – It will also look at the incorrect apportionment of rental income and expenses between owners, such as where deductions on a jointly owned property are claimed by the owner with the higher taxable income, rather than jointly. – It will look at holiday homes that are not genuinely available for rent. Rental property owners should only claim for the periods when the property is rented out or is genuinely available for rent. Periods of personal use can’t be claimed. This is particularly important for holiday homes, where the ATO regularly finds evidence of homeowners claiming deductions for their holiday pad on the grounds that it is being rented out, when in reality the only people using it are the owners, their family and friends, often rent-free. – It will keep a close eye on incorrect claims for newly purchased rental properties. The costs to repair damage and defects existing at the time of purchase or the costs of renovation cannot be claimed immediately. Instead, these are deductible over a number of years. Expect to see the ATO checking such claims and pushing back against those that don’t stack up. Don’t forget that the ATO has access to numerous sources of third-party data, including popular holiday rental sites such as Stayz and Airbnb, so it is relatively easy for it to establish whether a claim that a property was “available for rent” is correct. Workplace bullying is more than simply an interpersonal conflict—it can be a systemic problem that arises in the context of a poor workplace culture. It is best dealt with by taking steps to prevent workplace bullying long before it undermines individuals’ well-being or workplace relationships, or becomes a risk to health and safety. The most effective way to do this is by fostering a culture in which bullying behaviour is unlikely to thrive. All members of a workplace, including managers, play a role in preventing and managing bullying at work. Workplace bullying has significant effects on those directly experiencing or witnessing the bullying, as well as their families, the work team and the organisation. Employers have a clear legal obligation under work health and safety legislation to eliminate risks associated with workplace bullying as far as is reasonably practicable. This can be achieved through quality people management practices and specific workplace bullying strategies. 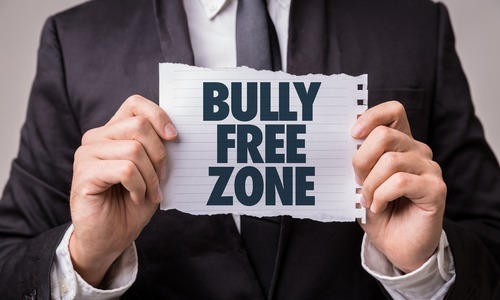 Workplace bullying can be the result of a range of individual and organisational factors, including a work culture or environment that permits inappropriate behaviour to occur, managers with poor people management skills, a lack of supportive leadership, and workplace stressors and risks. Be proactive in communicating standards of expected behaviour. Create a workplace where everyone is treated with dignity and respect. Design appropriate, realistic systems of work. Develop productive, respectful working relationships. Follow the organisation’s policy and processes if standards of expected behaviour are not met. Identify and model the behaviours that you need in your team. This will help you to create a work culture based on respect, where bullying is not tolerated. If there is bullying in your team or organisation, seek to understand its causes and impact in the context of the broader workplace culture. Identify and call bullying behaviours early. If bullying does occur, it is important to recognise this behaviour and act on it early. This will help to maintain a culture where bullying is not tolerated. Some people might be unaware that their behaviour might amount to bullying. It may be useful to have a conversation with the employee about their behaviour and its impact on colleagues. This will probably be a sensitive and difficult conversation and you might need to talk with your human resource team for advice on how to have the conversation. In some cases you might want a member of your human resource team to be there during the conversation. If you do not have a Human Resource Department, contact us to help. Manage workplace stressors and risks. Role conflict and uncertainty can sometimes lead to bullying behaviours due to the stress it places on employees. It is important to ensure that employees understand their roles and have the appropriate skills to do their job. This will help to minimise work circumstances that could lead to bullying, and can also help to minimise the risk of employees’ perceiving difference of opinion or management action as bullying. Provide regular and respectful performance feedback. Managers have a broad range of responsibilities including monitoring workflow and providing feedback to employees on their work and performance. When feedback is provided properly, with the intention of assisting the employee to improve their performance or behaviour, it is not bullying. To prevent performance management being perceived as bullying, it is important to focus on high quality, respectful, and regular performance feedback. Sound workplace policies can serve as a preventative tool to tackle bullying. The policy should be a clear statement of the standards of behaviour that are expected and the processes to follow if these are not met. Minimise the impact of bullying on the team. Bullying can affect employees who witness it, as well as those who experience it directly. Each employee will react differently to bullying behaviours. Reactions may include distress, anxiety, panic attacks, sleep disturbances, impaired concentration at work, low self-esteem, or reduced work performance. Employees who witness bullying behaviours may feel angry, unhappy or stressed about the work culture, or feel guilty because they know that the behaviour is wrong but feel unable or afraid to stop it. It is important to recognise and respond to early warning signs of employees who have been affected by bullying and support them to seek help. Bullying is repeated behaviour that could reasonably be considered to be humiliating, intimidating, threatening or demeaning. Bullying can be direct or indirect, and inflicted by one person or groups. A single incident generally does not constitute bullying. If you need help resolving bullying in the workplace, contact us. As we approach the end of the financial year it presents a time to review our businesses operations and performance, reflect on what has worked in your business from a marketing and operational perspective, assess whether you have had a ‘good’ or ‘bad’ year and plan for the coming financial year. Key to the above considerations is a clear definition of what defines a ‘good’ or ‘bad’ year: This question can only be addressed if an adequate KPI matrix or performance dashboard has been created to ensure this key information can be easily obtained. The performance of these indicators will determine whether a positive or negative result has been generated. Consideration of whether the business is capable of growing and if so, how best to achieve and fund this growth. No individual is capable of growth or improvement without some degree of self-reflection and businesses are much the same. Take the time now to reflect on your businesses performance with a view to identifying areas of improvement. It might just be the best time you invest all year! Generation Y is taking over the workforce! Lead accordingly. It’s no secret that the business world is being taken over by millennials; in a few short years, they’ll make up 75 percent of the workforce. Which means that, as an employer, you’ll need to spend some time thinking about how to engage this tech-savvy group. A highly studied generation that was practically born knowing how to navigate the internet. While money is still a motivational factor for most, it’s not the only one and it doesn’t guarantee job satisfaction or engagement. If you want to get more productivity out of your workers and keep them motivated, you’re going to have to get innovative. With a wealth of knowledge at their fingertips, millennials are informed and knowledgeable about their options. That doesn’t mean they aren’t ambitious but it does mean that fairly simple gestures and actions can speak volumes to this group. So, try offering your millennial workers flexibility with their time. Instead of dictating when they can use their holidays, let them take a day off on their birthday, visit a friend in hospital, or recover properly from a cold. The relationship between happiness and productivity is high. Happy workers take less sick days per year. Which means that simple policies like flex time can dramatically increase engagement. If your employees know you have their back, they’ll be more likely to go the extra mile for your company. The same can be said with showing trust. Millennials have grown up watching success stories like Facebook, Instagram, and Uber explode out of almost nowhere. They don’t envision their futures being part of a large conglomerate, or feeling like a cog in the wheel. They want to be a part of a hungry startup that’s going somewhere and get a taste for real innovation and creativity. So, trust them with big projects and let them take the lead. Another way to encourage engagement at work is by offering relevant and valuable on-the-job training. Especially when it comes to skills that can be transported to another role, or help employees to improve both professionally and personally. But if you’re thinking of compiling a Word document, think again. Throw your training manual out the window! The key to capturing the attention of Gen-Y is through cutting-edge emerging training methodologies. The kind that will appeal to and resonate with millennials. Millennials perform better outside of formal settings and using tools that they can apply to real-life situations, such as video, mobile, and gamification. The millennial generation is often referred to as one of “digital natives.” This basically means that they grew up with access to WIFI and parents who knew how to handle a computer. They’re far more likely to get engaged with their job position if you present them ongoing training through audiovisual means. A recent study on millennial behavior showed that video clips were one of the most effective ways of teaching concepts and showing knowledge applied to real-life situations. Videos also engaging and fun. The kind of hands-on approach that keeps millennial employees entertained, while catering to their learning needs. With the plethora of social media, SnapChat, Instagram, and Facebook, millennials love feeling connected and readily post about their lives online. They also look for jobs this way and find out about more information about your company through social learning. They’ll check out your reviews, what other employees have to say, and maybe even contact current employees on LinkedIn. They have a different way of trusting that places more credibility on peer reviews than highly regarding publications. Think about how that applies to training. When a millennial has a problem with a computer program or needs help putting a piece of furniture together, they’ll look for a solution on a YouTube. They’ll find a short video explanation, rate it, and pass it on. This type of learning actually has a name and is known as collaborative learning. Shared among peers who provide feedback and advice. Forget about lengthy training sessions and lectures. Millennials are smart and digitally switched on, but they also have shorter attention spans than their predecessors. This has brought rise to a new kind of learning, called micro-learning, that aims to break down important points into bite-sized, easily digestible pieces. Provide the information that they need, when they need it (just think about the YouTube videos) without them having to spend long periods studying or taking time out of work. Reduce your training sessions to informative whiteboards and short videos. Okay, so not all your millennial employees are going to jump at the chance of learning through videogames. But don’t disregard this new form of training. The competitive nature of video games makes them addictive and highly engaging, which can be a good fit for some millennials. Mentoring is a key factor in keeping employees engaged. They want to perform better and do well, get regular feedback and suggestions. This can be done face-to-face or through videos. Feeback videos can be just as engaging as one-on-one meetings and help reduce time, giving your employees the chance to learn on the job when they have a free moment. Innovating employee engagement doesn’t have to be restricted by your budget. It’s more about understanding your target audience and applying training methods and policies that resonate with their way of thinking. Create a supportive environment in which they can grow, take time out when needed and lead projects, with regular mentoring and feedback. And make use of tools to make learning as fun and accessible as possible. We would like to welcome Lisa Thomsen, Impact HR’s newest HR consultant. With over 20years HR experience, Lisa is a commercially minded HR Generalist bringing 10years management & business partnering experience to Impact HR. Lisa has worked for a range of industries across Australia & NZ in FMCG, Retail, Technology, Education & Not for Profit. Lisa has experience in employee engagement initiatives, reward & recognition programs and corporate functions to develop a healthy and engaged culture. 20 years of HR experience with 10+ years of management and HR Business Partnering experience gained across a variety of industries for both global organisations and local businesses. In this Q&A, Lisa tells us about her career highlights and what she thinks is the most important thing when it comes to achieving a great team performance. What brought you to join Impact HR? The opportunity to share my knowledge and experience with a variety of smaller companies to improve and grow their business. What’s your biggest career achievement? Successfully relocating and guiding staff through a merger with minimal disruption to operations. Being able to balance the commercial needs with the human aspects in a business by assisting staff and management to work towards the businesses goals in a positive and healthy culture. In your opinion, what’s the most important thing when improving your client’s team performance? That we have removed some or all of the factors causing the most stress for the client and becoming a trusted advisor they can rely on in the future. For many organisations, volunteering is an afterthought, but instead, volunteering should be a priority because of the unique advantages. Volunteering looks differently for each business, and volunteer efforts range from a company-wide volunteer day to allowing employees a set number of paid hours to volunteer in lieu of work. Corporate Social Responsibility (CSR) has an important impact on your company both now and in the future, and consumers and stakeholders are concerned with the impact your business has on both the environment and society. CSR is specific to each company, and most organisations choose issues that hold value to them or their industry. In addition to showing commitment, having a reputable CSR will allow your business to show passion for issues, and display company values to society. Organisations should spend time developing a CSR because it allows their employees to engage in the community and build a stronger society by addressing social problems. In today’s society, image is everything, and giving back is a wonderful way to improve your company’s image for both consumers and employees. Consumers are driven to support companies with a strong CSR, and the more visible your volunteer efforts are, the more improvements your rankings will see. Employees want to work for an organisation that is focused on more than the bottom line and increasing profit margins. As an employer, you need to perform compassionate acts so your employees will view you as human and considerate of others. This will help lower employee turnover and increase employee morale. If your employees see you trying to make a difference for others, they will be more driven to work harder. Many companies use volunteering as team-building exercises, and these volunteer opportunities are remarkable because they allow employees to work together while they are performing their volunteer efforts. Not only does this make a difference in society, it builds camaraderie among fellow coworkers. A volunteer event could be an excellent way for employees to meet each other and foster relationships. Employees will be able to bridge the gap between departments and teams to learn more about one another including strengths and weaknesses, and this will be beneficial for future group projects. Compassionate. Empathetic. Humble. Gracious. Helpful. These are typical qualities of avid volunteers, and by allowing your employees to volunteer, you are fostering these character qualities in your employees. This will help your workforce build character traits that will be an asset to your corporation because they will be able to enhance their leadership and professional skills. Fellow employees will be more inclined to work with employees that have these qualities, and in turn, this will increase your work production. Volunteering also gives employees an identifiable role within the business. Research has shown that volunteering has lowered stress levels and improved people’s overall health. One of the beauties about volunteering is that you are making a difference no matter what route you take. Whether it is having a company-wide day to stock a food pantry or allowing your employees to take several hours at a time to volunteer for a cause of their choosing, every effort matters. If organisations want to designate specific charitable organizations for volunteer purposes, they can choose causes that impact their local community or have a national or global impact. Many businesses choose issues that are specific to their industry. Volunteering offers so many benefits for everyone involved, whether it is the organisation, employees, or people directly impacted by the volunteer efforts. Every company should be involved in volunteer opportunities of some aspect because of the benefits offered to the company and society. You want to establish actionable KPI targets that are tangible and immediately relevant. Aim too high with your targets, and you risk deflating your team before you start. Aim at a target that doesn’t exist today, and you’ve created noise without any signal. A KPI is a metric with a target that is core to your business’s performance. Every business has objectives, which are typically goals in regards to revenue, customer success, marketing mindshare, and productivity. You can’t get from point A to point B without understanding point A, your starting point. Dig into the data, allow yourself time for discovery, and provide an honest reckoning of your performance. This will give you the basis of setting your KPI targets. By evaluating your current performance, you get a dose of reality. Nothing kills KPIs or motivation like impossible stretch goals! You’ve interrogated the data, and now know the truth behind your numbers. It’s time to start plotting your way forward and start by setting a long-term KPI target. This gives an overall vision to your strategy, and a goal to work backwards from. From here, you can start to figure out short term KPI targets. The real benefit of setting short term KPI targets is that it gives you almost immediate feedback on your processes and ability to execute. Unachievable objectives deflate teams and drain morale. KPI targets must motivate and reward hard work. Success is not created in a vacuum. Leading businesses and growth experts are democratic in the way they rally their team. Data transparency is a success factor. In other words, take your KPI targets to your team and review them in an open, honest environment. Encourage feedback and act on it. If you’re a sales director, and your frontline team is telling you that there’s no way they can hit your new targets, then you must listen to them. We aspire to achieve KPI targets because we want to push ourselves to do better and improve. If the targets you’ve suggested instantly deflate your team, identify root causes. Are they lacking visibility into the processes that influence positive outcomes? The journey towards achieving KPI targets will have you innovating and auditing current processes. You can be firm on your targets, yet still empathise with the challenges in execution. As a manager, your job is to remove obstacles. The business world would be much simpler if you could just set KPI targets and automagically achieve them. It’s not. Business is complex, and growth is challenging. You need to continually evaluate your performance at regular intervals. A monthly reporting cadence is natural and an ideal starting point. It allows time for your projects to take hold and influence your numbers. The key to it all is communication. Be bold in your transparency and you’ll be rewarded with input and contributions from unexpected places. Part of communication is championing the continuous review of your KPI targets. Keeping a direct line of sight on your performance and talking about it openly helps everyone stay on track. It’s officially Autumn! Although it feels unseasonably warm now, cooler weather is on its way and with that comes cold and flu season! How can the flu impact your workforce? What can you do to help prepare your employees and encourage wellbeing? Not only is the flu a threat to our health, but also to the wellbeing and productivity of our organisations. Your company culture should make employees feel comfortable staying home when sick. Although some may consider coming to work regardless of how you feel a show of dedication, it can actually be very counterproductive! When your employees feel under the weather they are often less productive, they risk spreading illness to colleagues, and they can be hindering their own recovery by not taking time to get well. The flu vaccine is considered the most effective way to protect from the flu. NSW Health recommends everyone ages 6 months and older who want to reduce the likelihood of becoming ill with flu get a flu vaccine annually. With flu season generally beginning in April and peaking between June and August, NSW Health encourages vaccination during autumn months. As part of your workplace wellbeing efforts you can consider offering an on-site flu shot clinic to make it quick and easy for your employees to get the vaccine. What else can you do to prepare your workforce? Educate employees about flu symptoms, how the virus is spread, and what they can do to prevent getting sick. Also, help make sure they understand the difference between colds and the flu. Encourage increased hygiene. Though it seems like common sense to cover your coughs and sneezes and to wash your hands often, they are still important reminders. The flu can be spread through these methods even before you start feeling symptoms. Keep disinfecting wipes handy to clean frequently touched surfaces like doorknobs, keyboards, and phones. Provide tissues, hand sanitisers, and other supplies to promote healthy hygiene. Communicate with employees to review company policies regarding sick leave and working from home. You don’t want sick employees coming into the workplace and risking the health of coworkers, so make sure they know their options. If your organization wants to encourage working from home when not feeling well, make sure to arm employees with the necessary technology for working remotely. Help foster employee well-being by encouraging healthy behaviours this flu season!